There will be no napping with this thriller in hand, not with an impending World War. In this 10th installment of The New York Times best-selling Pike Logan series, local author and retired Special Forces Lieutenant Colonel Brad Taylor delivers riveting action and intrigue once again, only this time, trading the backdrop of tumult in the Middle East for Eastern Europe and vestiges of the Iron Curtain. Adding to the suspense, Logan’s extralegal counter-terrorism unit, Taskforce, is on stand-down from the highest office, and the protagonist finds himself operating even further outside the law. 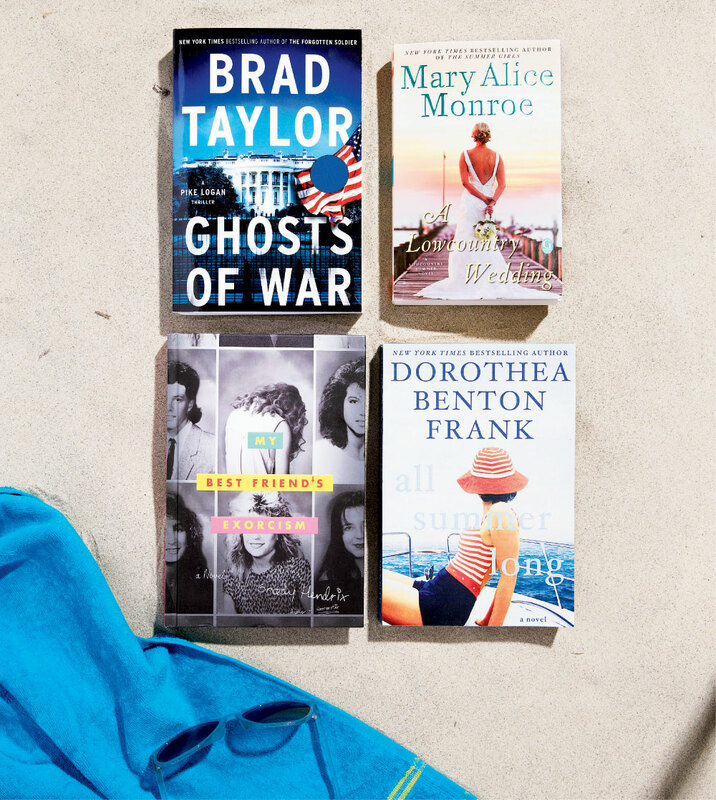 If you gobbled up the first three books in Monroe’s A Lowcountry Summer series, you’ll want to put this final installment at the top of your beach-read list. (Didn’t delve into the others? No worries, Monroe weaves the backstory into the plot.) All three sisters have again gathered at their Mamaw Muir’s Sullivan’s Island beach house, except it isn’t actually Mamaw’s anymore, and that’s only one of the troubles hindering what should be joyful months of planning two weddings. Surprises and secrets will keep you turning pages past bedtime. Hendrix may live in New York today, authoring weird, dark, utterly inventive fiction, but he was once a local, growing up in the Old Village. And it’s there, and throughout the Lowcountry, that he sets this tale of two best friends making their way through Albemarle Academy together in the ’80s. Suddenly, at the start of sophomore year, good-girl Gretchen gets possessed, and a terrifying chain of supernatural events unfolds. Readers will hate to close the back cover on this thriller—brilliantly styled to look like a yearbook, complete with ads and classmate signatures. Interested in the lives of the über-rich? In her latest novel, The New York Times bestselling author (and Sullivan’s Island resident) Dottie Frank takes readers on a romp from Manhattan to Sullivan’s to Sir Richard Branson’s Necker Island and beyond—all over the course of one summer. Travel with New York interior designer Olivia Ritchie and her billionaire clients as she grapples with shedding the trappings of her big-city life, accompanying her husband to his native Lowcountry, and resurrecting her business, all the while questioning what matters most.